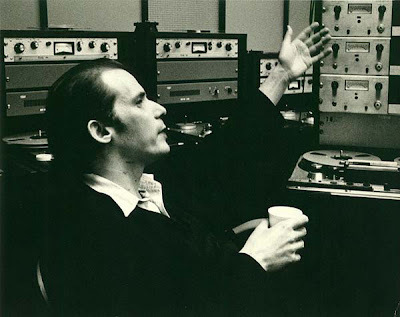 Last year I wrote about the record which Glenn Gould (above) described as the 'best damn record we've ever made' - his LP of Tudor consorte music. Today I am writing about the best damn record he never made. The USA has strong copyright laws; sound recordings essentially don't go into the public domain until well into the 21st century. But, in the European Union (EU), for example, recordings go into the public domain 50 years after their first release. Small recording companies in the EU already re-issue CDs of historical mono recordings in volume. That's been a small concern to the labels, but in 2006 the situation gets troubling. 1956 was the start of early stereo, which is how we still listen nowadays. Starting in 2006, the "good stuff" from 1956 forward starts going into the public domain. Year by year, labels will lose European rights to the most prized, profitable recordings in their archives. With global retailing, CDs made in the EU are readily available anywhere. The way around this is to create new, highly-desirable music recordings, which establish a new copyright. A modern re-recording can be a premium product, protected with the latest Digital Rights Management (DRM). For a modern re-recording to be acceptable to discerning jazz, classical, and pop listeners, it must be faithful, note-perfect, and identical to the original performance. That’s our business." "In our contracts we look like a cross between an artist and a record producer, receiving a combination of fixed fees and a portion of the royalty stream of the release." Are Zenph Studios "an entertainment technology company that specializes in software and processes for understanding - and re-creating - precisely how musicians perform"? Or are they a vehicle for "establish(ing) a new copyright ... protected with the latest Digital Rights Management (DRM) ... receiving a combination of fixed fees and a portion of the royalty stream of the release"? The jury is out. But the copyright date on my CD of Gould's 1955 Goldbergs is 1956, which means it is among "the "good stuff" from 1956" which has entered the public domain in the EU. Today, here in the EU, the "re-performed" Goldberg's on the Sony Classical label retail for £14.99 ($30.52), and the original mono 1955 recording is available on Naxos for £5.99 ($12.20). considering MIDI parameters are defined in a resolution of integer values of 0 -127, & the assignment of these numbers to an expressive performance domain of an instrument is entirely arbitrary decision, i don't really see what is particularly "high resolution", "nuanced", or remotely authentic about the process.